When I discovered that the Chinese New Year begins on January 23rd, the first thought that popped into my head was, “Whoa! Another new year, another chance for a do-over!” The second was, “We should go out for a Chinese dinner Monday night.” The third was, “Oh wow! 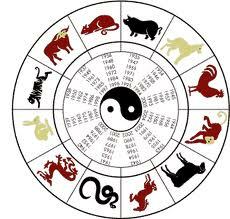 I should check out my Chinese horoscope!” Then it occurred to me that I hadn’t even checked my astrological horoscope for 2012. My fascination with astrology started in the 7th grade when a group of my friends and I walked from school to the neighborhood drug store. The glass display case we dashed to was filled with penny candy. After gazing at the myriad of choices, we each selected our favorite sweets. Then we discovered a cup on top of the counter filled with colored scrolls printed with astrological signs and horoscopes. They prophesied the future for the whole month! One of my friends knew all about them and we deciphered which sign we were. As an Aries, I was pretty excited about being a ram and a leader, but I wasn’t so crazy about the whole head-butting thing. I began flipping through the Wisconsin State Journal for my daily fix of fate. There was something so thrilling about checking to see if today would be that very special day when something wonderful would happen. Most of the time, they were warnings or totally irrelevant since I was twelve years old. I would roll my eyes and disregard most of those messages from the great beyond. For years I relied on magazines for my monthly prognostication. One time, I read a Mademoiselle magazine during the month of my birthday which forecast a year full of changes. It said something like, “Be ready to relocate and take a leap of faith.” Well I did both a few months later when my husband Danny and I began dating which only lasted a short time. By October we were married and I found myself towing a U-haul trailer out to Colorado. I always regretted not keeping that horoscope. It was the first one in 29 years that was dead on! Later, my interest in horoscopes waned. My husband and two children became the focal point of my life. To be honest, I was really happy and didn’t see a reason for any prophecies. A couple of years ago while getting my hair colored, the stylist told me I should check out Chinese horoscopes. She found that many of her prophesies came true. I looked up my sign and realized I was born during the year of the dog. Ha! Now I knew why I was so loyal. Even when a relationship wasn’t healthy, I would still find myself wagging my tail, anxious to be included. Loyalty can be a good thing too. Now that my kids are in college, I have finally found time for myself and have begun writing. Once again I am wondering about my future. I decided to check both astrological and Chinese horoscopes to see how they compared. After Googling Aries prediction 2012, a list of forecasters appeared. The top horoscope provider seemed to be the most reliable since it was first on the list and had the name Ask Ganesha. I just knew with a name like Ganesha, I would be in very good hands. I was sold by the first line of my forecast: “Aries is the first zodiac sign and the year 2012 is coming up to be an exceptional year for personal growth.” Yes! I knew Ganesha would come through for me! My year will be golden! After doing a happy dance around my kitchen, I sat down to see what else she had to say. – It will be a year of learning and idea exchange. Procrastination should be avoided. I’ll try to get around to that one. – My profit is supposed to multiply. Note to self – Work on making a profit this year so it can multiply. – Be tactful when dealing with loved ones. I can do that once in a while. – My love life is supposed to rock! I am already married so all those relationships I am supposed to have from July to September are not going to happen. My husband concurs. I am sure the rest of the predictions are accurate! Thanks Ganesha! Next I checked my Chinese horoscope. I Googled Chinese Horoscope 2012 and the top provider was Fengshuidiy. The site seemed pretty legit to me so I clicked on Dog. What a downer; a doggie downer to be exact! The opening line was, “The 2012 Chinese zodiac horoscope predictions for Dog are not so good.” What? Did I have the right creature? Yes, unfortunately I did. “Due to a few bad stars, you have obstacles in the working place.” Dang stars! “You also may lose money in the speculative market and have some big expenditures.” Well that is the total opposite of my astrological forecast! The prophecy went downhill from there and included warnings such as, “beware when using sharp tools,” and “mind your personal hygiene.” Geez! Happy Chinese New Year anyway! Have you ever gone to a psychic? Seriously, I don’t look up horoscope this way I’m surprised by the day’s event. Btw, I’m psychic. I know you sometimes visit a land that is “open” and there is a big saloon in it or is it “salon”. Do you know me? Okay Jose! You got me! Hahaha! Give me a hint….Trudge is that you??? Thank you! I would need a translator….. Ran across your blog and love it! Thanks so much Jen! I hope you will be back soon for another wild ride! Loved reading this. Such fun to just read about what is predicted for the year. I dont like to take it seriously but just read the predictions being the inquisitive person that I am. Thanks for sharing. I am glad you could relate. I am curious, although I wrote this 10 days ago and still haven’t checked out any of the links that commenters left! I guess they are supposed to be more accurate, but I kind of like being surprised by life, like seeing moose on the bottom of Peak 7 at Breckenridge today! Hahaha! Great article, if you’d also like some astrology/psychic advice, maybe you’d like to read my Tarot Horoscopes for this week. I do a tarot card reading for all the Zodiac Signs. i love astrology and have a strong faith in it but along with hard work. Really an amazing and lovable post. Thanks Flats! I hope you will stop by again soon! horoscopes have always been a big part of my life! theyre always spot on! Hi Bex! That must be so great. You probably really stay on top of them then. I only look at them pretty rarely, however there was a site mentioned in this comment section that I checked out and may again next month. You never really know how this ever expanding universe works! Great article and i really like it and i believe in Astrology.somehow it deals with star of our life…isn’t it……….. I really don’t know that much about it, but I do find it really interesting to read once in a while! I think you could be right! Thanks for stopping by! I don’t put too much into astrology or fortune telling. I prefer to make my destiny as I see fit. Every day’s different. Those scrolls always seemed to limit me; it’s so much more fun to just step out and see where I land! Just like the weather! Hahaha! Thanks for coming by to read!